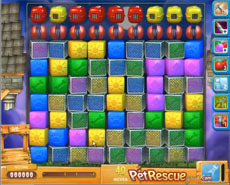 Release the pets from their pet boxes and then try to drive them to the bottom of the screen, clearing the blocks under them. You can be helped in your task by the line blasters there are in the screen and the mesh mash booster, that gets activated while clearing the blocks. Not a difficult level indeed. For those of you that find it difficult to beat Level 484 why don’t you watch our vid?